Religious assemblies in Bali again agreed to propose a 24-hour internet halt during the Nyepi Holy Day on the 7th of March. 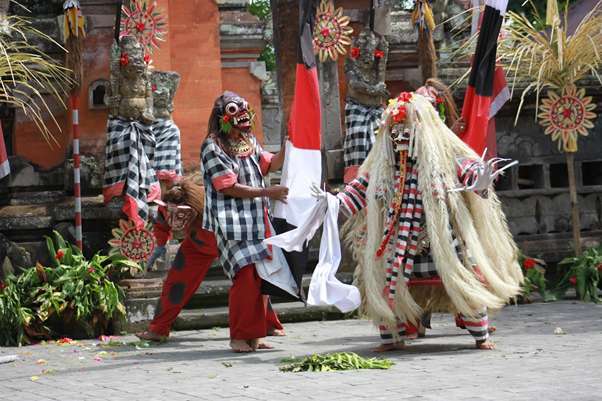 The Bali Regional Indonesian Broadcasting Commission (KPID) along with the Bali Provincial Government and the Bali DPRD signed a memorandum of understanding regarding the appeal not to broadcast and relay broadcasts during the Nyepi day on March 7. The purpose of terminating the internet was the same as what was done last year, so that Hindus can be solemn to carry out Nyepi day and keep no provocation, no bad words on social media that are not good when Nyepi day. Nyepi in previous years often appeared slander, utterances of hatred, and insulting words sent by irresponsible people on social media, even leading to fights. The hate speech about Nyepi in Bali is sent via social media and the internet. So that there arises resentment and slander between religious people in Bali. Even though the internet will be turned off for 24 hours on Nyepi day, it does not apply to the interests of government facilities, hospitals, airports, security and other vital public facilities. The internet will be accessible in these places, for example hospitals to access insurance services whose data is internet based. 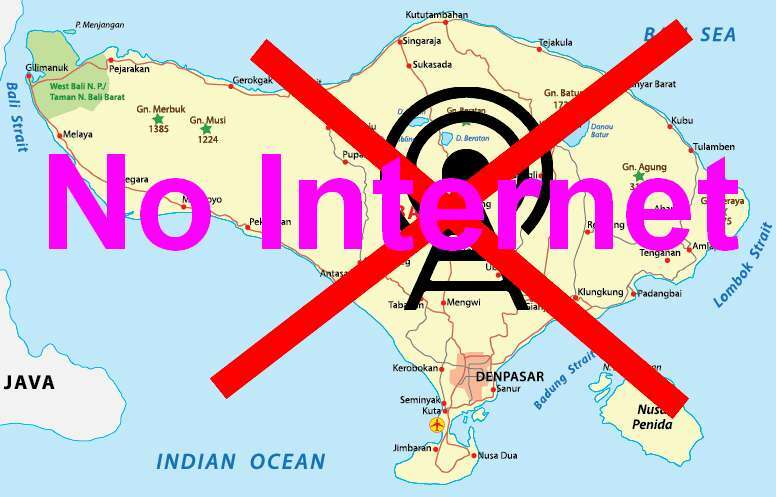 Not only the internet will be turned off during Nyepi, also television and radio broadcasts. Stopping all television and radio broadcast activities in Bali has been carried out in the last few years, and it is very effective and without contra. 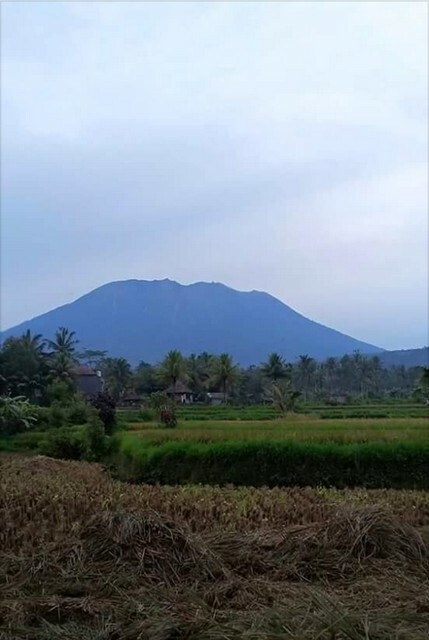 Update about volcano eruption in Bali, Mount Agung last few days seems very calm. From visual observations, it appears that a cloud of gray smoke soars, distinct as it did on November 25, 2017, when the volcano was first declared erupted. Every day citizens and tourists look for updated news about this volcanic eruption. Until now, the latest update on the volcano eruption in Bali continues to be the center of people's persuasion. 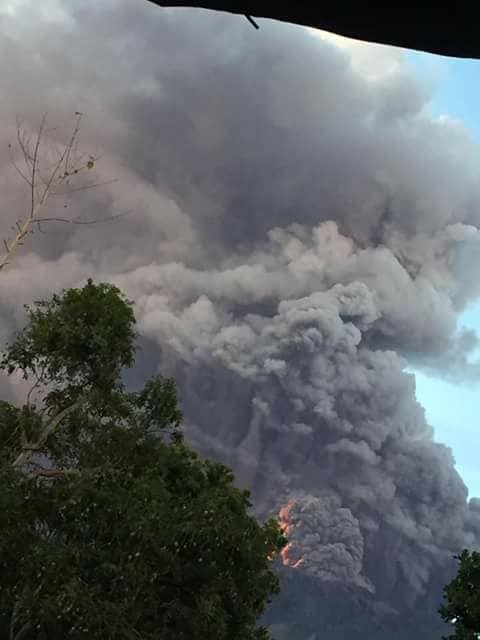 From periodic reports every six hours delivered by the Center of Volcanology and Geological Hazard Mitigation (PVMBG), this time the volcano is only visible white smoke with a thin intensity billowing as high as 500-1000 meters from the top of the mountain. Based on information from the Center for Volcanology and Geological Hazard Mitigation (PVMBG), the current update on the mountain melets in Bali, that the possibility of magma from inside the mountain that came out into lava at the top of the crater of Mount Agung is now cooling and eventually hardened. If the lava has come out to the surface, the lava will quickly cool down. The more up the thicker the lava clot. It depends on the surrounding air temperature. Freezing lava of course affects the movement of magma from the stomach of Mount Agung. There are still many questions that need to be revealed related to the freezing of lava at this peak of the mountain. The question then is whether the cooled lava because the magma of Mount Agung ran out of energy or precisely when rising to the surface is blocked by a hardened lava clot. In addition to an update on the puff of smoke at the peak of volcanoes in Bali is diminishing, also updates about SO2 levels are detected also experienced a very drastic decline, which is 20x lower than last week. SO2 is in the air when the first eruption occurs to be a warning to avoid this compound because it is very toxic and can interfere with breathing. Is this a sign of Mount Agung already entering the final phase of eruption? The first possibility, if the energy of Mount Agung has begun to decrease then the eruption does not occur, because the magma can not break the frozen lava blockage that amounts to 20000000 cubic meters or 1/3 of the volcano volume in Mount Agung. This update is very useful to be able to perform further action related to the handling of natural disasters volcano eruption in Bali. When volcanoes in Bali erupt and disrupt the arrival and return of tourists in Bali, contrary to that just released several of the most popular and best destinations, the best hotels, the best amusement parks, the best restaurants and some of the best ratings by TripAdvisor user choices from around the world on 2017. From the release released by TripAdvisor, Bali is one of the preferred users of TripAdvisor as the world's most popular tourist destination. Not only this time, already from recent years Bali was selected as the island's best tourist destination. 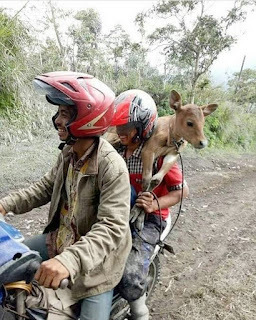 It can not be denied, because Bali has many reasons to be the best. Cheap, whatever there is, whatever there is, anything close, fun, Balinese are very friendly, culture well preserved, safe, father of choice hotels and villas. As quoted from TripAdvisor, the following 7 most popular destinations of the world, including one of which is ranked the top is the island of Bali, Indonesia. Mount Agung is always a concern. The latest update on the volcano in Bali today is what is visible and observable by naked eye, that this volcano looks very calm. Only a whitewasm of visible white smoke, without the usual massive ash blast as it erupted on November 25, 2017 until the next several days. 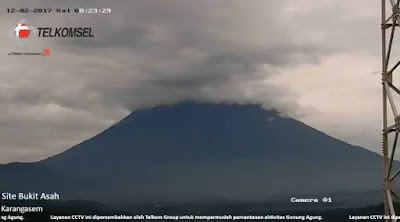 The latest information from the relevant authorities on the volcano in Bali, after two shaken overscale tremors, the activity of Mount Agung is now beginning to calm down. Since Thursday November 30, 2017 to Friday 1 December 2017, Mount Agung only issued white smoke as high as 1500-2000 meters above the peak. The latest update shows a sign that the mountain is still resting, almost the same as the eruption in September 2017, initially occurred a cloud of smoke with hundreds of earthquakes, but a few days later returned to calm. Head of Sub-Division for Mitigation of the Eastern Volcanoes of Volcanology and Geological Hazard Mitigation (PVMBG) explained that from monitoring PVMBG, Gunung Agung was observed to emit a cloud of white smoke. 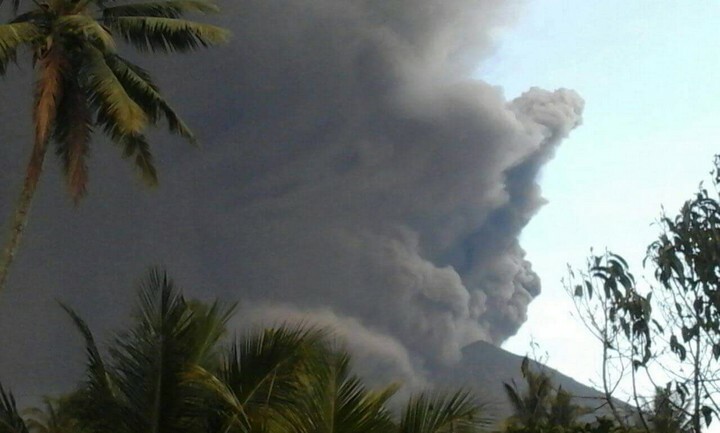 The information and updates of this volcano in Bali will continue to be submitted. 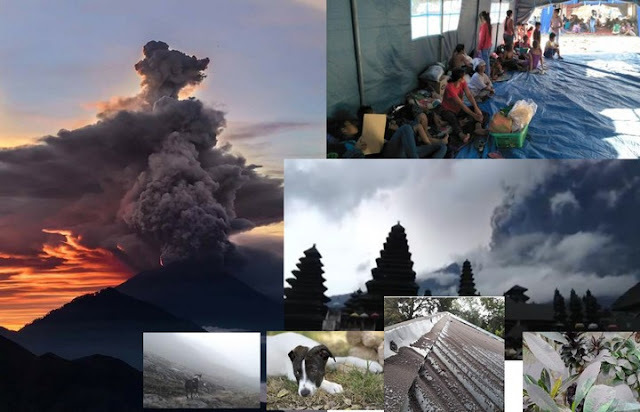 So people do not panic when there is greater activity on Mount Agung in Bali. 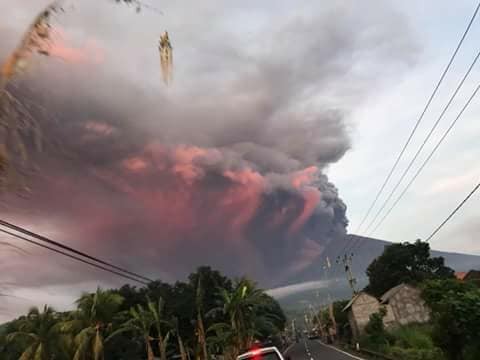 The condition of the volcano in Bali is not like a few days ago, when the highest mountain in Bali was always spraying dark, dark-colored volcanic ash. This latest update can certainly confuse citizens and related authorities. Because the residents are already waiting, but Mount Agung looks more calm at this time. Although the latest update on the eruption activity of Mount Agung appears calm, the relevant authorities explain that activity inside the crater of the mountain continues to occur. It is recorded on a device that records an ongoing tremor shock. Small and large earthquakes can be felt up to several kilometers from the top of the mountain. This earthquake shows that the mountain is still active and can erupt at any time. The existence of magma movement inside the mountain urges upward. Although it can not be observed from a mountain monitoring site, the effusion or growth of lava to the surface of the crater is still ongoing. Based on the results of earthquake recording. The latest update on Friday night about the condition of volcanoes in Bali, that earthquake shook Karangasem regency on Friday night approximately at 09:54 pm. An earthquake of magnitude 3.5 SR occurred at 8.27 LS - 115.64 east longitude (17 kilometers northeast of Karangasem). An earthquake with a depth of 6 kilometers was estimated related to the activity of Mount Agung. Although it is located far from the top of the mountain. Center for Volcanology and Geological Hazard Mitigation (PVMBG), does not dismiss if the earthquake is related to the activity of Mount Agung. Although the location is quite far from the mountain. 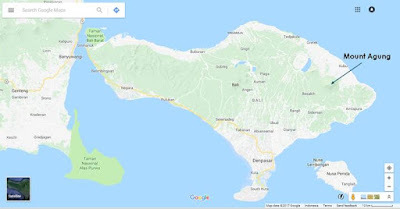 Based on the latest update about the volcano, about the earthquake that occurred east of Karangasem regency as far as 17 kilometers, it is clear that the magma in the earth is very unstable and move the earth's crust. It also shows that there are still many magma still pressing the earth's crust in Bali, so it can exit through Mount Agung, the highest volcano in Bali. The Center for Volcanology and Geological Hazard Mitigation estimates that a major explosion from Mount Agung will occur shortly. This estimate is a consideration to raise the mountain's hazard status from level III to level IV. Until Monday, the eruption of Mount Agung is still observed with a thick cloud of smoke reaching a height of 2,000 to 3,400 meters. The rays of fire are visible from inside the crater. 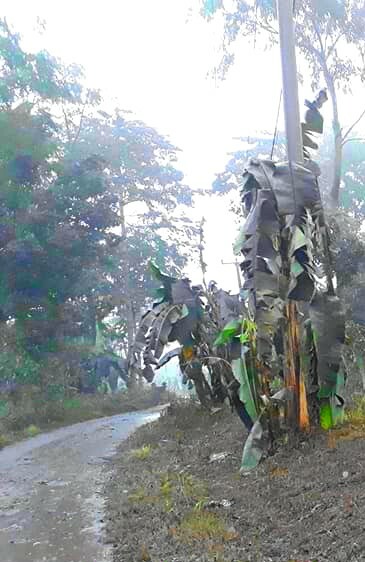 Explosive eruptions accompanied by a weak boom sounded up to a distance of 12 kilometers (km) from the peak of the mountain by the Balinese called Tohlangkir it. The rays of the fires that are more noticeable at night, Sutopo said, indicating a major eruption was imminent. November 27, 2017, from 00:00 am to 06:00 pm, local authorities recorded Mount Agung underwent one eruption with a weak 40 second duration, one nonharmonic tremor with a duration of 1.832 seconds, a single volcanic quake in duration of 31 seconds, and three times a shallow volcanic earthquake of 7-11 seconds. Continuous tremor (microtremor) is recorded with an amplitude of two to three millimeters. The ash rain continued to fall at the observation post. November 27, the wind blows weakly to the southwest and west. 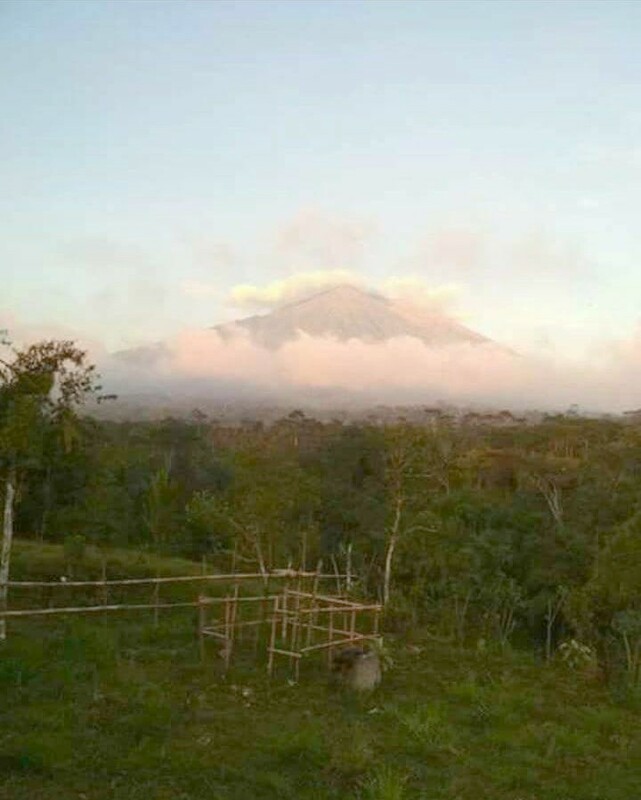 The local authorities appealed to residents around Mount Agung, climbers, visitors, and tourists not to be and perform any activity in the danger zone. Rising in the state of luminosity, the zone covers all areas within a five kilometer radius of the crater plus sectoral expansion to the north-northeast and southeast-south-southwest as far as 10 km from the crater. Cold lava floods occur in several rivers. 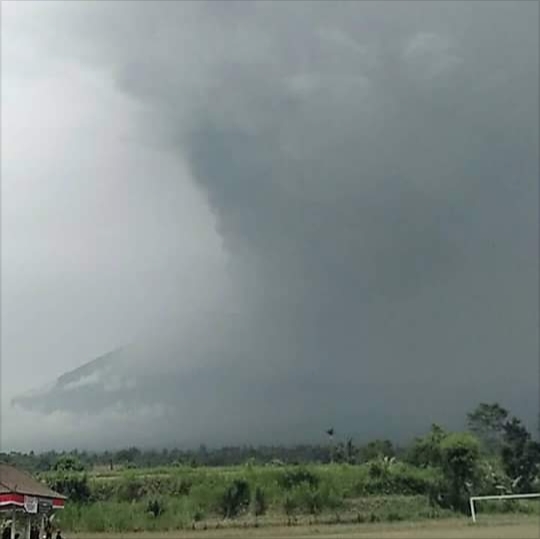 The impact of the eruption of Mount Agung accompanied by heavy rain. The most famous volcano in Bali is Mount Agung, now erupting. Signs of eruption have occurred since early September 2017 with hundreds of earthquakes, but stalled in late October. Now this mountain is erupting with bursts of ash and sparks of hot lava at the peak. In some rivers with upstream in Mount Agung is now experiencing cold lava flood. Cold lava floods in the river caused by lava coming out of the top of the mountain exposed to rain water. This cold lava flows together with rain and river water. The color of the river water mixed with cold lava is gray brown. 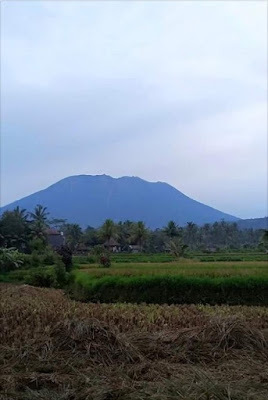 Balinese residents are encouraged to avoid the flow of the river flowing at Mount Agung because at any time could be affected cold lava flood from the mountains that ever erupted in 1963 that terrible. 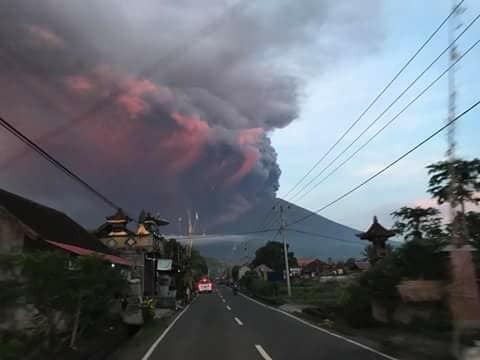 Cold lava floods will also increase as rain around Mount Agung will increase, especially now Bali is in the rainy season. Local authorities urged residents to be wary of lava floods or cold lava floods. The phenomenon of the emergence of cold lava flood caused eruption or volcanic eruption that surely sprayed various materials such as ash, gravel, sand, and chunks of rock that settles around the crater and the slopes of the mountain. All materian eruption of volcano will hanyud carried by river water with support of rain. So that the cold lava flood in the river. When it rains, the water mixes with the material from the eruption and moves down the slope downstream with all the eruption material. If Mount Agung has finished erupting, then the eruption results can provide high economic value to the citizens. 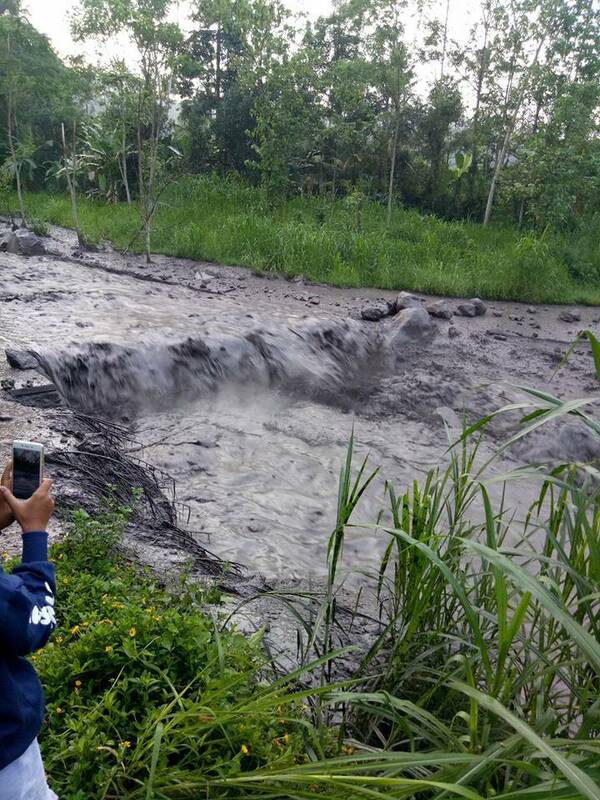 Known material eruption of Mount Agung which was carried by rain water began to flood rice field near by River Yeh Sah, Village Batusesa, District Rendang, Karangasem, Bali. From the observation of local authorities, this lava phenomenon is derived from the southern slopes of Mount Agung or the upstream of Sebudi Village. From the observation it has checked this cold lava, because there is smell of sulfur and fall of ashes that occurred last two days. The impact of Mount Agung erupts is the movement of ash towards the airport. The eruption of Mount Agung caused the spread of ash extends. I Gusti Ngurah Rai Airport closed at 07.00 am Monday, November 27, 2017. The closure of the airport in Bali is done up to 24 hours ahead, to see the situation further related to the ash condition that led to the airport. This closure is made through Notice to Airmen (Notam) issued at 07.15 am. Volcanic ash is known to have closed the air area of ​​Ngurah Rai Airport. Ash from volcanic eruptions is very dangerous for aircraft flight activity. Volcanic dust has closed air space at the airport up to two levels. Visually, the thickness of volcanic ash is very thin, the particles are very small and small. This dust began to be seen at the airport since 05.30 am, Monday, November 27, 2017. Although the dust that attached to the kuru is very thin, but the air space is covered in volcanic ash. Lombok Airport was closed on Sunday (November 26, 2017) but was declared safe return for flight on Monday morning, November 27, 2017. 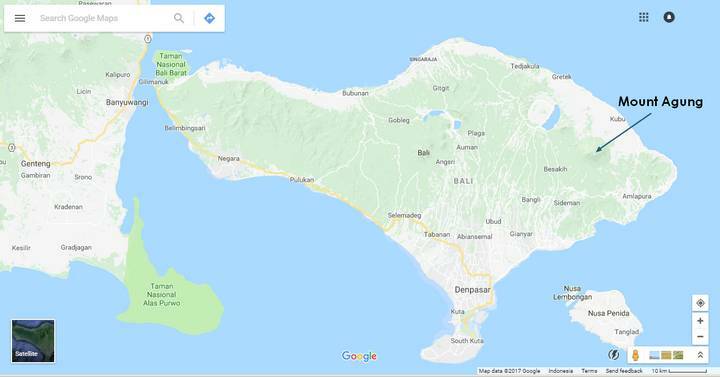 The closure of airports in Bali and Lombok due to ash coming from the eruption of Mount Agung, Ash blowing southward, to the airspace of Denpasar. Ngurah Rai airport authorities have issued a NOTAM, which states the airport was closed for approximately 24 hours, starting from Monday (27/11/2017) 07:00 am, until Tuesday (28/11/2017) at 07:15 am. According to a study conducted by NASA, volcanic ash could impair the functioning of propellers on turboprop or jet engines in turbofan planes, vital components in aircraft flights. It has been proven from an incident that had been experienced by Boeing 747-200 aircraft belonging to British Airways. The plane with callsign Speedbird 9 (flight number BA09) on June 24, 1982 made a flight route Kuala Lumpur - Perth. In the middle of the journey, while crossing the island of Java, Indonesia, Speedbird 9 trapped in the middle of the ash eruption of Mount Galunggung. The four B747 engines died from vacuuming the silica of Galunggung. The pilot then decided to lower the cruising altitude from 36,000 feet to 12,000 feet. Luckily, the pilot finally managed to re-start the engine aircraft after flying at lower altitudes and free from the siege of volcanic ash. Very small silica dust, diameter between 6 microns to 2 mm, can be carried by the wind easily, and because ejected from the crater of the volcano, the dust can soar up to the height of roaming the plane. Because it is so small and light, volcanic ash is difficult to remove, and takes a long time to disappear completely if action is not taken immediately. If this happens and is left, then for a long time the dust that sticks in the body or components of the aircraft can cause delicate cracks in the body of the aircraft. 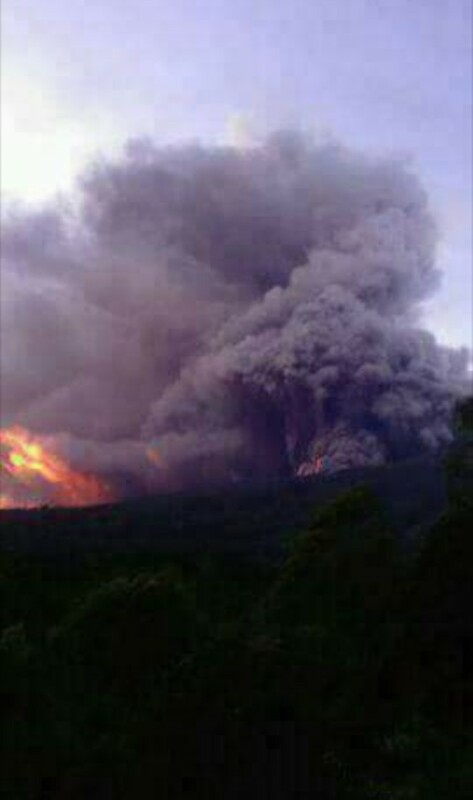 The volcano in Bali is now erupting, at its highest level, Level IV. Mount Agung erupts with a blast of ash. The Center for Volcanology and Geological Hazard Mitigation has raised the status of Gunung Agung from level III (Siaga) to level IV (Awas) on Monday 27 November 2017. This is the highest level for a volcano. The most active volcano in Bali is Gunung Agung, and has gained two times the highest level since showing signs of erupting in September 2017. Head of Volcano Mitigation Division I Gede Suantika explained that the status of Mount Agung is raised from standby to be alert because of the increased activity from the phreatic phase to the magmatic phase. It was observed from November 21, 2017, 00:00 am, a significant change in activity up to 25 November 2017. 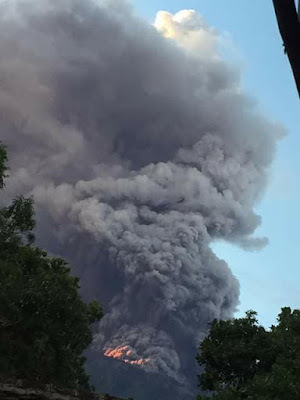 Mount erupted in Bali until today magmatic phase eruption accompanied by thick ash continuously reach the height of 2000-3400 meters from the top of the mountain. In addition, the increase in status from level III to level IV for Mount Agung is characterized by an eruption with continuous asphalt eruptions accompanied by explosive eruptions, as well as a strong sound of booms being heard in a 12 kilometer radius from the summit of Mount Agung. From the signs of the volcano is that there will be a greater potential eruption, and may soon occur. Therefore, the status of Mount Agung is raised from standby (level III) to alert (level IV) since Monday, 27 November 2017, at 06.00 am. The disaster-prone zone radius was widened from the previous 6 kilometers and 7.5 km sectorally, now to 8 kilometers and added by sectoral extension to the north east, southeast, south, southwest, as far as 10 kilometers. Citizens, visitors, travelers, not staying, do not climb any activity in the danger zone. 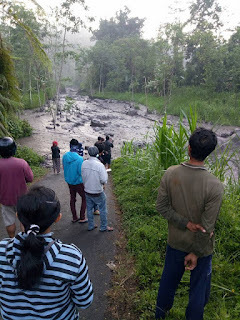 The villages affected by the eruption of Gunung Agung, namely Ban Village, Dukuh Village, Baturinggit Village, Sukadana, Kubu, Tulamben, Datah, Nawakerti, Pidpid, Buwana Giri, Bebandem, Jungutan, Duda Utara, Amertha Bhuawana, Sebudi, Besakih, and Opportunity. The red glowing lava at the top of Mount Agung erupts. Mount Agung eruption in Bali, Bali's most active volcano now erupts and begins on Saturday, November 25, 2017. 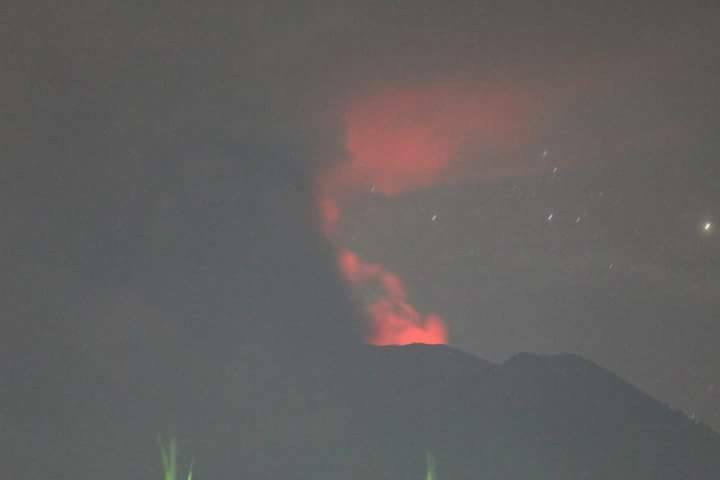 Up to now, an eruption at 3,000 meters alight protruding from gray smoke, there is a red light allegedly lava above the mountain peak. There was also a loud explosion at the top of the mountain. The red rays look very clear at night. 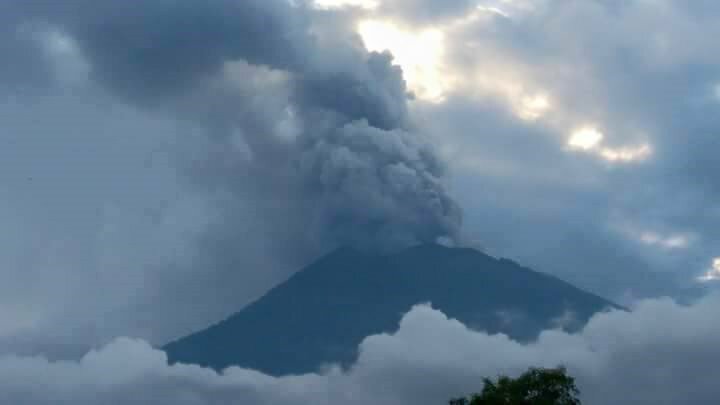 Based on the Geological Agency report, PVMBG, Observation Post of Gunungapi Agung, explains, from the observation period at 06.00 pm to 12.00 am, Sunday, November 26, 2017 Gunung Agung continues to erupt and there is a fire in the peak. The eruption occurs once, Non-Harmonic Tremor once, Low Frequency once, shallow volcanic once, and non-harmonic tremor continuously from 06.00 pm - 12.00 am with dominant amplitude of 3 mm. Mount Agung's status is still at level III. For the people and tourists around Mount Agung to avoid climbing and do not carry out any activities in the hazard prediction zone that is inside the crater area of ​​Mount Agung and in all areas within a 6 km radius of the mountain top crater, plus the sectoral extension to the North- Northeast and Southeast-South-Southwest as far as 7.5 km. 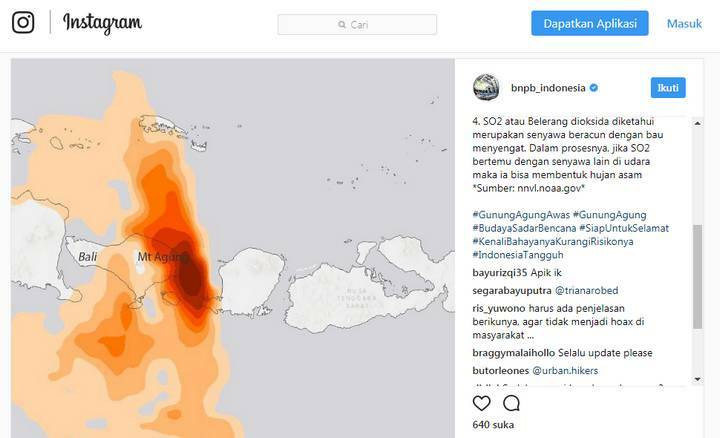 Estimated Zone Dangers are dynamic and continuously evaluated and can be changed at any time following the most recent observations of Gunung Agung's observations. It was reported earlier that Mount Agung erupted on Tuesday, November 21, 2017 at around 17:05, issued a phreatic eruption. Then followed by the eruption that occurred on Saturday, November 25, 2017 at around 17:20, then at around 09:00 pm Mount Agung issued a magmatic eruption.